TeamPage Fall 2014 Release Introduces inline @ mentions. An @ mention makes it it easy to bring any TeamPage item to someone’s attention just by typing their name. Automatic inline completion makes @ name lookup easy. 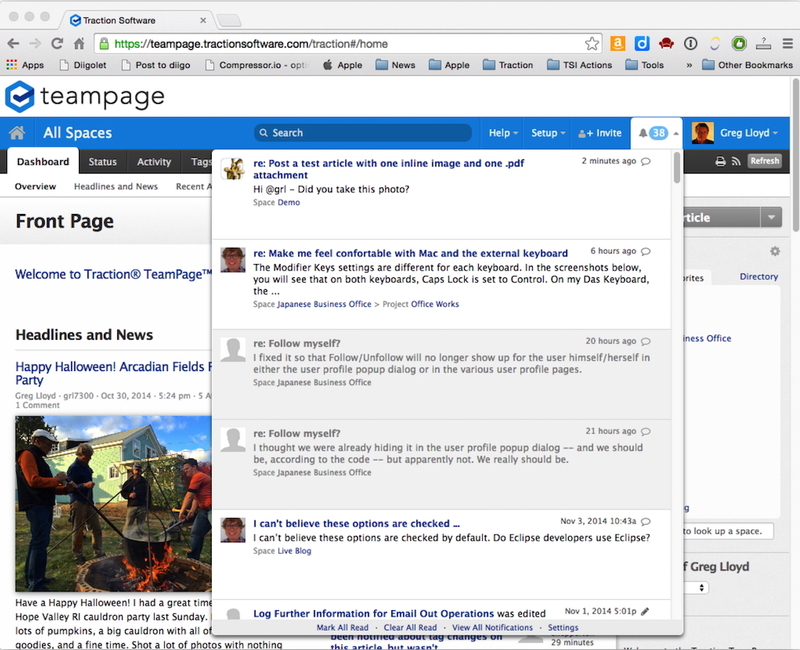 When a person is mentioned, TeamPage will automatically notify them of follow on comments. Reply to the inline or email notification to add a quick response from your smart phone, tablet, or a Web browser. This is a great way to bring someone into a conversation without sending a hand authored email, text message or other message. @ mentions extend TeamPage's Work Graph model using notation that's familiar from Facebook, Twitter, Google+ and other Web services. When you want to bring a discussion, task, or status post to someone’s attention, just type their @ name, full name, title or any part of their email address. Auto inline completion for @ mentions works in rich text articles, status posts, and comments. That person will get a TeamPage notification, including a link to the article or comment where you mentioned them. By default TeamPage will add the thread in which the person is mentioned to their personal Watch list, so they'll get notifications of follow on comments. Greg Lloyd can delete the Watch subscription if he no longer wants to get notifications. To make @ names easy to find, the @ name is now shown with each person’s profile page, pop-up mini profile, and is included with TeamPage search results preview. TeamPage also does auto completion lookup for @ user name mentions in articles, comments, and status posts. Move Article - Makes it easy to move the content and attachements of an article from one space to another, then delete the original article. Advanced Search - By default, duplicate files aren't listed in search results. TeamPage SDK updates - Adds SDK support for @ mentions, adds new API capabilities, updates recommended interfaces. 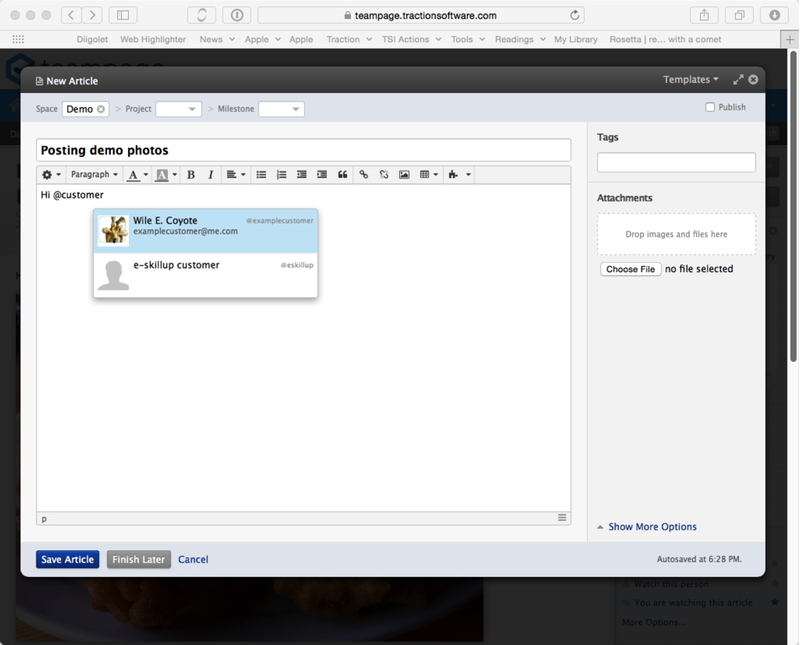 Space Templates - Updates and improves Project Team, Wiki, Intelligence templates. Adds new Management Team template. Updated internationalization, bug fixes, performance, and other improvements.